Hema L. Ramkumar, MD, K. David Epley, M.D., Koushik Tripathy, MD (AIIMS), FRCS (Glasgow), Peter A.Karth, MD, Usha Rajapuram Kumar, MD and Vinay A. Shah M.D. The electroretinogram (ERG) is a diagnostic test that measures the electrical activity generated by neural and non-neuronal cells in the retina in response to a light stimulus. The electrical response is a result of a retinal potential generated by light-induced changes in the flux of transretinal ions, primarily sodium and potassium. Most often, ERGs are obtained using electrodes embedded in a corneal contact lens, which measure a summation of retinal electrical activity at the corneal surface. The International Society for Clinical Electrophysiology of Vision (ISCEV) introduced minimum standards for the ERG in 1989. The ERG can provide important diagnostic information on a variety of retinal disorders including, but not limited to congenital stationary night blindness, Leber congenital amaurosis, and cancer-associated retinopathy. Moreover, an ERG can also be used to monitor disease progression or evaluating for retinal toxicity with various drugs or from a retained intraocular foreign body. The first known recording of an ERG was performed on an amphibian retina in 1865 by the Swedish physiologist Alarik Frithiof Holmgren. James Dewar of Scotland subsequently performed it in humans in 1877, however widespread clinical application did not occur until 1941, when American psychologist Lorin Riggs introduced the contact-lens electrode. In 1908, Einthoven and Jolly separated the ERG response into three components: a-wave, b-wave, and c-wave, which are further described below. Many of the observations and analyses that serve as the basis for understanding the ERG components today were conducted by Ragnar Granit for which he won the Nobel Prize for Physiology and Medicine in 1967. Granit’s studies were primarily conducted on dark-adapted, rod-dominated cat retina with which he was able to demonstrate the physiology of the receptor potential of each component of the ERG. This wave reflects the hyperpolarization of the photoreceptors due to closure of sodium ion channels in the outer-segment membrane. Absorption of light triggers the rhodopsin to activate transducin, a G-protein. This leads to the activation of cyclic guanosine monophosphate phosphodiesterase (cGMP PDE) eventually leading to a reduction in the level of cGMP within the photoreceptor. This leads to closure of the sodium ion channels resulting in a decrease of inwardly directed sodium ions, or a hyperpolarization of the cell. The a-wave amplitude is measured from baseline to the trough of the a-wave. The hyperpolarization of the photoreceptor cells results in a decrease in the amount of neurotransmitter released, which subsequently leads to a depolarization of the post-synaptic bipolar cells. The bipolar-cell depolarization increases the level of extracellular potassium, subsequently generating a transretinal current. It is this transretinal current that depolarizes the radially oriented Muller cells and generates the corneal-positive deflection. The b-wave amplitude is generally measured from the trough of the a-wave to the peak of the b-wave. This wave is the most common component of the ERG used in clinical and experimental analysis of human retinal function. The c-wave is a reflection of the resulting change in the transepithelial potential due to the hyperpolarization at the apical membrane of the RPE cells and the hyperpolarization of the distal portion of the Muller cells. The c-wave generally peaks within 2 to 10 seconds following a light stimulus, depending on flash intensity and duration. Due to the c-wave response developing over several seconds, it is susceptible to influences from electrode drift, eye movements, and blinks. Dark adapted Oscillatory potentials: Responses primarily from the amacrine cells/inner retina. Latency of response refers to the onset of the stimulus to the beginning of the a-wave. 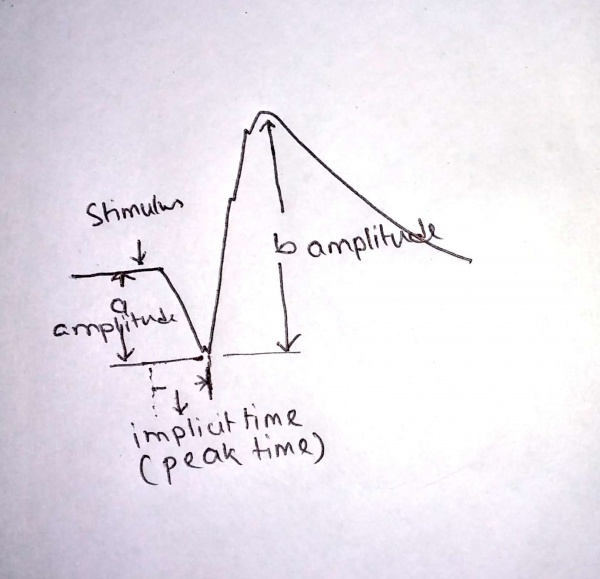 Implicit time or peak time is a measure of the time interval from onset of the stimulus to the peak of the b-wave. For single-flash ERGs, in cases of Xenon flash tube, the duration of flash is less than a milisecond. Light emitting diodes (LEDs) produce longer flashes upto 5 milisecond, and peak time in such cases should be measured from the midpoint of the flash to compensate the effect of flash duration on the peak time, according to the current ISCEV guidelines (2015 update). Burian-Allen Electrode- (commonly used electrode for flash ERG) variable lens sizes consisting of an annular ring of stainless steel surrounding the central polymethylmethacrylate (PMMA) contact-lens core with a lid speculum. Insert corneal contact electrodes (when these are used) under dim red light after dark adaptation period. Avoid strong red light. Allow 5 min of extra dark adaptation after insertion of contact lens electrode. Allow at least 30 min recovery time in ordinary room illumination after use of strong light for retinal imaging (fundus photography, fluorescein angiography and others). Request the patient to fix and not move eyes. Ocular movements can change the positions of electrodes, can cause blockage of light by eyelids or electrode and may induce electrical artifacts. This includes 6 protocols named according to the strength of the stimulus in candela. second/square meter (time integrated luminance). Dark-adapted 0.01 ERG (a rod-driven response of on bipolar cells). Dark-adapted 3 ERG (combined responses arising from photoreceptors and bipolar cells of both the rod and cone systems; rod dominated). Dark-adapted oscillatory potentials (responses primarily from amacrine cells). Light-adapted 3 ERG (responses of the cone system; a-waves arise from cone photoreceptors and cone Off- bipolar cells; the b-wave comes from On- and Off-cone bipolar cells). Light-adapted 30 Hz flicker ERG (a sensitive cone-pathway-driven response). The rod and cone photoreceptor function responses can be separated using a variety of ERG techniques. Scotopic (rod) responses are isolated by dark-adaptation for a minimum of 20 minutes per ISCEV standards followed by a short wavelength stimulus as a single flash or 10 Hz flicker. Although the resulting response has rod and cone components, the rod component is dominant and the primary contributor to the increased amplitude and increased implicit time. Photopic (cone) responses can be obtained either before or after dark-adaptation. Since rods cannot follow a flicker stimulus greater than 20 Hz, cone photoreceptor function is primarily measured under light-adapted conditions for at least 10 minutes with either single flash (stimulus wavelength greater than 680 nm) or 30 Hz flicker stimulus. Photopic responses result in small b-wave amplitudes with a short latency (30-32 ms), whereas scotopic (rod) conditions produce much larger b-wave amplitudes with a longer latency (60 ms). Oscillatory potentials (OP) are high-frequency, low-amplitude wavelets on the ascending limb of the b-wave with a frequency of about 100 to 160 Hz. Although it is not known for certain, it is suspected that OPs are generated from the amacrine cells located in the inner retina. Rods cannot respond to stimulus with a flickering rate of more than 20Hz. Cone response thus can be recorded using ISCEV light adapted 30Hz flicker ERG. Peak wavelength sensitivity of rods and cone-groups is different (510 nm and 560 nm respectively). Using specific color filters or colored flashes specific response from a specific system may be recorded. The time integrated luminance of the stimulus and background in absolute values. The focal ERG (fERG; also known as the foveal ERG) is used primarily to measure the functional integrity of the fovea and is therefore useful in providing information in diseases limited to the macula. A variety of techniques have been described in the literature for recording fERGs. Differing field sizes varying from 3 degrees to 18 degrees and light stimulus frequencies have been used in the various methods, however each technique deals with the challenge of limiting amount of light scattered outside the focal test area. Focal ERG is useful for assessing macular function in conditions such as age-related macular degeneration, however requires good fixation from the subject. The full-field ERG (Ganzfeld; ffERG) measures the stimulation of the entire retina with a flashlight source under dark-adapted (scotopic) and light-adapted (photopic) types of retinal adaptation.This is useful in detecting disease with widespread generalized retinal dysfunction i.e. cancer associated retinopathy, toxic retinopathies, and cone-rod dysfunction. Due to the massed retinal electrical response, small retinal lesions may not be revealed in ffERG recordings. The multifocal ERG (mfERG) simultaneously measures local retinal responses from up to 250 retinal locations within the central 30 degrees mapped topographically. This new technology was developed by Erich Sutter in the early 1990s and involves powerful computers and high –intensity display monitors. The light stimuli are presented on a video monitor in one of a large number of arrays consisting of hexagonal elements. The hexagonal elements in the array are distributed so that the focal retinal responses have an approximately equal signal-to-noise ratio. The central hexagons are smaller than those in the periphery. The elements are stimulated in a pseudo-random sequence of light and dark, called a maximum length sequence (or m-sequence). The resulting waveforms are similar to those of the ffERG: initial negative deflection (N1 or a-wave), followed by a positive deflection (P1 or b-wave), and a second negative deflection (N2 or c-wave). MfERGs are useful in detecting localized abnormalities within the retina in conditions such as retinitis pigmentosa, branch retinal artery occlusion, fundus flavimaculatus, and Stargardt’s disease. Degree of retinal toxicity related to certain drugs such as hydroxychloroquine or ethambutol is better detected using mfERG compared to ffERG. Early visual field defects due to glaucoma may also be detected sooner using mfERG compared to automated perimetry. The pattern ERG (PERG) uses pattern-reversal stimuli similar to VEP testing and captures retinal ganglion cell activity predominantly in the N95 waveform component. The PERG is used to detect subtle optic neuropathies. In demyelinating optic neuropathy, the PERG is relatively normal, while it may be abnormal in ischemic optic neuropathies. P50 evaluates the macular function. American Academy of Ophthalmology. Retina/Vitreous: Electroretinogram (ERG) Practicing Ophthalmologists Learning System, 2017 - 2019 San Francisco: American Academy of Ophthalmology, 2017. Bach, Michael, et al. “ISCEV standard for clinical pattern electroretinography (PERG): 2012 update.” Doc Ophthalmol 126 (2013): 1-7. Berrow, Emma J., et al. “The electroretinogram: a useful tool for evaluating age-related macular disease?” Doc Ophthalmol. 121 (2010): 51-62. Vincent, Ajoy, Anthony G. Robson, and Graham E. Holder. “Pathognomonic (Diagnostic) ERGs a Review and Update.” Retina, the Journal of Retinal and Vitreous Diseases. 33.1 (2013): 5-12. Young, Blair, Eric Eggenberger, and David Kaufman. “Current electrophysiology in ophthalmology: a review.” Current Opinion Ophthalmology. 23 (2012): 497-505. This page was last modified on July 18, 2018, at 11:48. This page has been accessed 200,313 times.